Halloween, the latest DLC for the Dead by Daylight brings new mechanic called obsession. 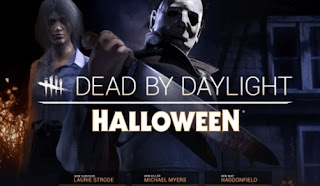 Basically, it is a special perk that was integrated with the killer Michael Myers into the game. But because these skills are also teachable, the other killers can soon make use of them. Survivor Laurie Strode, who is the sister of Halloween killer Michael Myers, also has special perks with which she can choose herself as an obsession. This ability can also be learned by another survivor. In this guide we will show you how "obsession" works and how you deal with it as a player. - Dying Light: You get an obsession. If they die, then the other survivors get a punishment and their speed in repairing, sabotaging and healing is greatly slowed (19%, 22%, 25%). If the obsession remains alive, then only their speed of action is increased (38%, 44%, 50%). - Play with Your Food: You get an obsession. If you chase and escape your obsession, you get one up to three bonuses, which greatly increases your movement speed (5%, 6%, 7%). This includes the passing of windows, slamming and running. However, every offensive attack consumes a bonus again. - Save the Best for Last: you get an obsession. As long as your obsession is still alive, the stun-time is reduced (14%, 18%, 20%). This time is also reduced after successful attacks, eg: when you hit them during the strike (25%, 29%, 33%). As you can see, the Perks are mutually exclusive. Therefore, you should never equip all three at the same time. Your playing is crucial here. If you kill your obsession at the beginning of the match (Dying Light), then the other two Perks are horrifying and are useless to you. In the ideal case, you must first know how you intend to proceed. Do you want the other Survivor to do more with everything they do, or do you want to recharge your batteries and gain strength and speed through your living obsession? Only the killer and his obsession can see at the bottom of the screen what survivors are affected by the obsession. You can see this because right and left of the name of the respective Survivors are gripper arms of the entities. The survival of your obsession is decided by the game. However, this can also be influenced by the survivors, if they have the corresponding Perk. There is always only one obsession per match. The game starts and you hear a sound? If your arms are entangled around your lower left edge of the screen, then you can be sure that you are the obsession. Sometimes the bombshells wiggle around your name. This is the sign that the killer is watching you. What is special about the obsession is the fact that there are abilities here, which are strongly interdependent. If you take the Obsession-Perks as Survivor, it can also be that you have a killer who does not play in "mode" of obsession and then these are useless for you. Above all, the survivors' abilities are dependent on those of the killer, but the reverse is not so bad, because the killer has his obsession one way or another and can refuel power. Last Survivor: If you have equipped this ability, which greatly increases your chance to be captured by the killer's obsession. The more your Teammates die, the stronger you become. In addition, the killer's aura read capability is interrupted more and more with each killed survivor until it is completely gone. Object of Obsession: If you are the obsession and look in the direction of the killer, you can see each other at a certain distance (56 m, 64 m, 72 m). But you have to be outside your terrorist radius. Decisive Strike: You have the chance to get rid of the killer by using a skill check when he carries you on your shoulder. So you stun the killer even (3, 4, 5 seconds). If you are the obsession, you should be aware of the scope. You harm your Teammates, whether you are alive or dying. If you live, the killer is faster, you die, slows down the speed of the other survivors. Moreover, you must provide yourself, you don't know what plan the killer is pursuing. It can be natural that he wants to kill you right at the beginning. So be careful, in case of emergency, you can bring your trump out of the sleeve and free yourself from the catch of the killer. After that you should play something "invisible". You will see for yourself what plan the killer is pursuing, let him escape you, then he will kill you as the last.